The Celeb 850 LED DMX Center Mount Kit was put together by Kino Flo for photographers and videographers who want to take studio-quality lighting with extensive color and control options on the road. The kit includes one Celeb 850 LED DMX fixture with a 90-degree honeycomb grid, and 120U and 230U power cords. A 60-degree grid is available as an option. Also included is a plywood and metal-constructed shipping case with recessed latches and built-in wheels. Flexibility and comprehensive control options are key to the production of the Center Mount Celeb 850 LED DMX from Kino Flo. The 45 x 25 x 6" panel uses three menus with features that can be controlled on the light via traditional wired DMX or by Lumen Radio wireless DMX with separate purchase of a Lumen transmitter. The White menu allows control of 1-100% dimming, color control from 2700-6500K, and Green/Magenta control. There are two Color menus. The first offers an extended color range from 2500-9900K and includes a channel called "Gel" that offers multiple presets for light conditions such as mercury-vapor and 100 often used gel filters. There are also channels for Hue Angle and Saturation that work together by selecting a specific color and determining the intensity of it. The second color menu provides RGB (Red, Green, Blue) control to permit a user-selected combination to obtain any color in the visible spectrum. The Celeb 850 DMX is ready for worldwide use thanks to its 100-240 VAC power supply. The light comes with a 90-degree honeycomb grid to tighten its light beam and limit spill light. A 60-degree grid is available as an option. Both 120U and 230U power cords are included for maximum flexibility. This version of the Celeb 850 has a Center Mount that allows the fixture to spin 360 degrees to produce a wide range of desired angles. 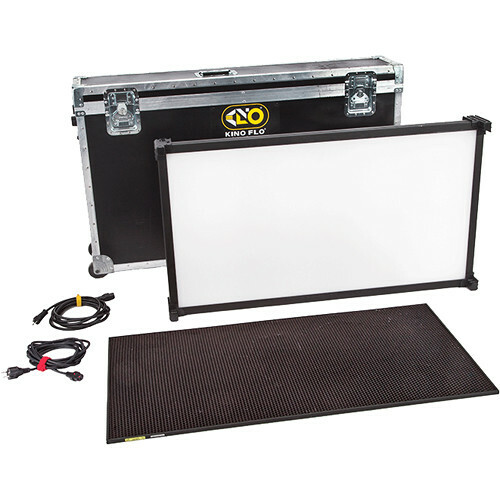 Store, protect, and transport a Kino Flo Celeb 850 LED DMX Center Mount Kit with the black Kino Flo Ship Case with Wheels. This sturdy case features vinyl-clad plywood construction with reinforced edges and corners. Users will appreciate the custom-cut interior, recessed butterfly latches, and spring-action handles. The handles facilitate two-person carrying. Wheels on one end make travel over flat ground easier. Box Dimensions (LxWxH) 49.0 x 33.6 x 11.0"
Box Dimensions (LxWxH) 52.0 x 32.0 x 30.0"